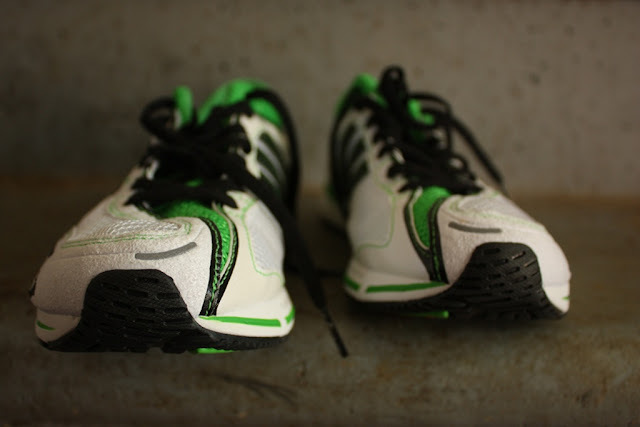 I'm taking another step down in my move to a more minimal running shoe with these Addidas. It's not at all as bare bones as the Feelmax, but there's almost no lift in the heel and they are extremely lightweight. After running for a couple of months last fall in next to nothing shoes, I had to take time off due to TOFP, quickly perceived as top- of- the- foot- pain on barefoot forums (sigh.) I went overboard and made sure I was all healed up, though I never saw a doctor to make sure I was actually broken (another sigh.) But, I'm taking things very slowly because I do not want to lay off again. I've already modified my gait (about 180 steps a minute) and "landing", so now it's just about slowly stripping away all of the commercialized, constricting, support and padding. Most minimal and barefoot runners advise to begin with 5 minutes or less a day with bare feet and gradual increase distance and speed as your skin, muscles, tendons, etc can take it. Maybe when it warms up, I'll do this in some fashion, but plenty of people have made the transition gradually wearing shoes and being very cautious. And that's what I'm doing. Besides, I keep picturing the roadkill on the country roads around my home and shudder at the thought of bare feet. Having started soccer right at the time I decided to go back to my minimal shoe experiment makes tracing the cause of any pain or strains more difficult. 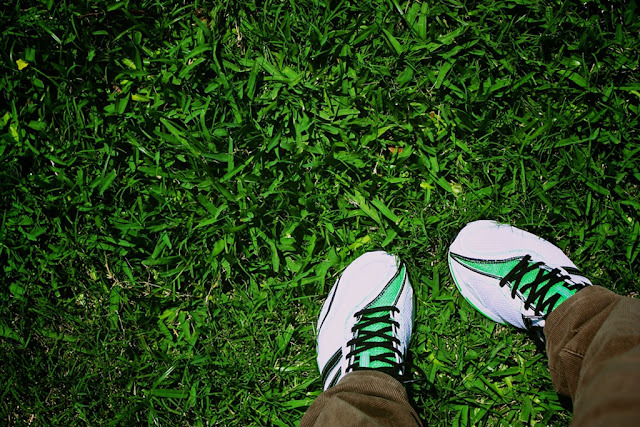 After those Sunday games, my ankles and feet are truly weary, so I'm introducing the Adizeros for walking and everyday wear. Eventually, I'll take a few runs a week in them. If I feel "that pain" again, I'll slow down on using them. They are a cushioned shoe, but have almost no heel lift and the one time I did run in them, my knee felt incredible. This is my transportation of choice, my most favorite thing to do, so I'm babying my feet.